What's a birthday without a delicious birthday cake?! Just look at those creamy, chocolatey layers! This is the perfect birthday card for the sweets lover in your life, or the person who spends weeks before their birthday planning out their perfect birthday cake. The balloons and confetti offer an element of fun, while this card is simple enough to fit anyone's special day. Do you wish your loved ones the best? Do you want them to have happiness and affection through all the days of their lives? 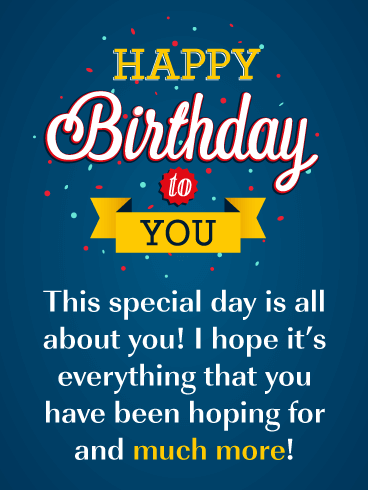 Then send them a Happy Birthday card that wishes them love, success, and happiness! The colorful balloons will add a touch of celebration and your well wishes will show them how much you love and care about them! For some people, birthdays are the perfect time to party and have a wild time. 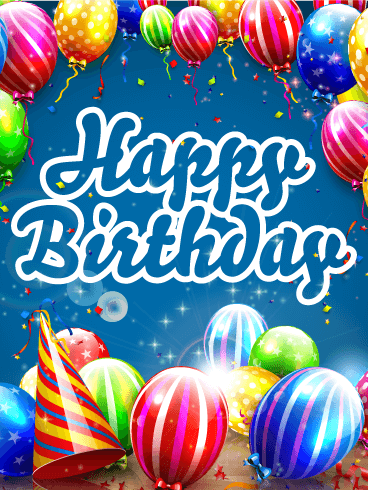 For others, birthdays are a day to relax, take a deep breath, and enjoy a peaceful day. 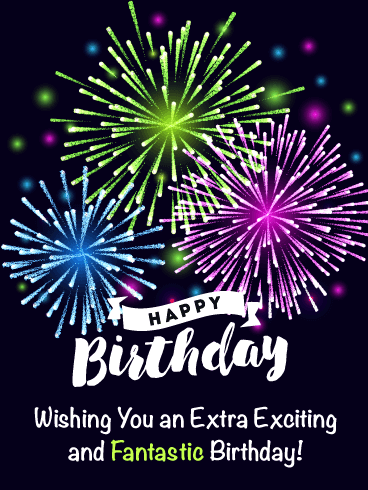 If you know someone who enjoys a peaceful birthday, help them celebrate in their favorite way with this Happy Birthday card! 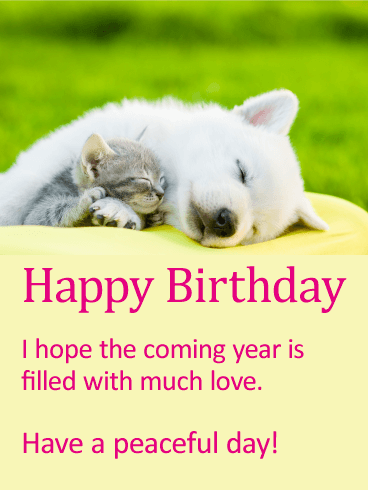 The sweet message and relaxing picture will help them have the best birthday possible! 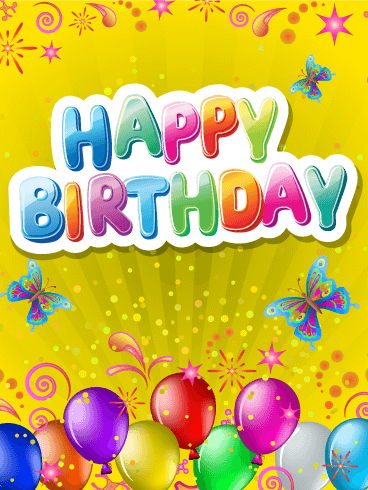 Butterflies flit and flutter to bring sweet birthday messages. The fragrant rosebuds, newly blooming, offer a fresh and elegant way to say, "Happy Birthday!" 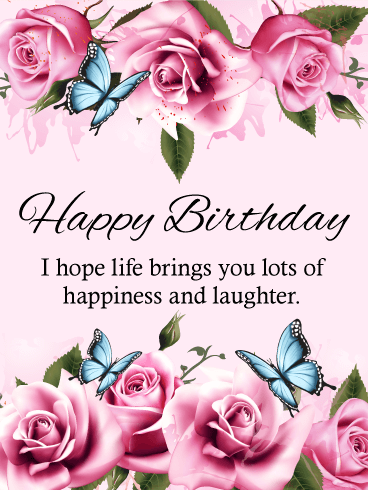 Light up their day with this lovely birthday card that reminds us of new life, transformation, and beautiful beginnings. 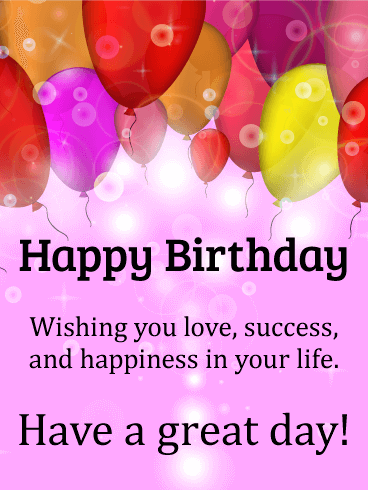 Send this pretty and pink birthday message today. It's so simple to spread good wishes with our heartfelt birthday cards. What's the best way to celebrate a birthday? With a delicious cake and this fun Happy Birthday card! This birthday card is full of all the best parts of a birthday party. 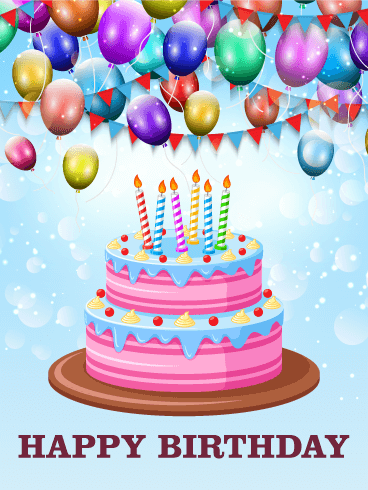 The bright, sparkling balloons, colorful pendants, and beautifully decorated cake will make this the best card to receive on their special day. 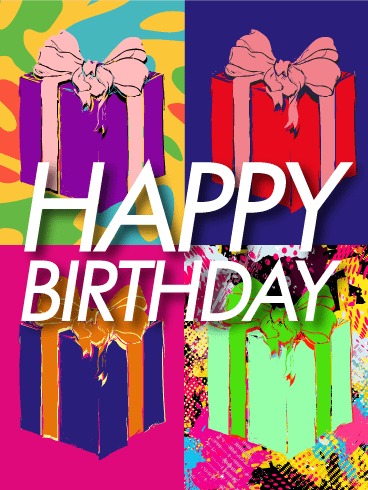 Send this birthday card to your favorite birthday girl or boy today! 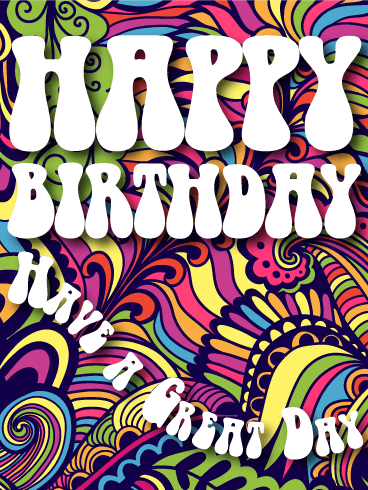 Looking for a birthday card that screams fun and happiness?! Look no further than this blue background, bright-colored beauty! 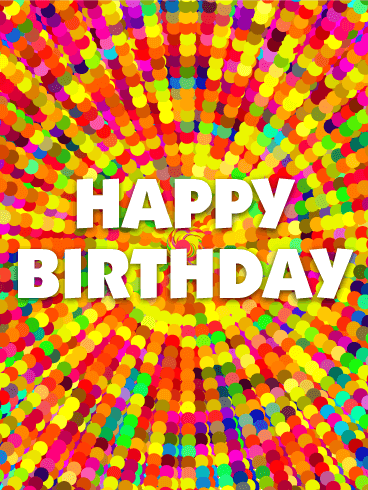 With its multicolored balloons and sparkling confetti, this birthday card has the perfect amount of celebration without going over the top! It's a great choice for anyone in your life who's celebrating a birthday, from a family member to a colleague at the office. Birthdays are made for fun, laughter, and happiness. 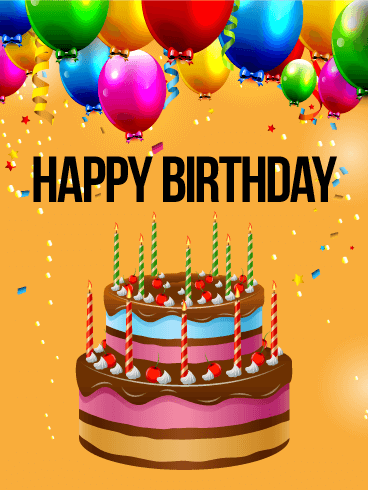 This year, make your loved one's birthday a day of joy and humor by sending them this Happy Birthday card! The cute and silly pug will make them laugh, while the Happy Birthday hat will get them excited for their celebrations! 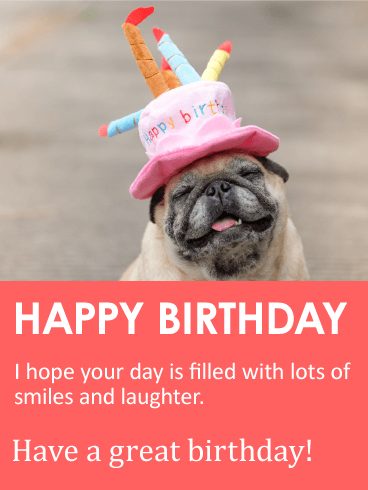 Send your wishes for day of smiles and laughter with this smiling pug happy birthday card today!